Home > Australia > 1844 Colony of New South Wales and Australia Felix. 1844 Colony of New South Wales and Australia Felix. 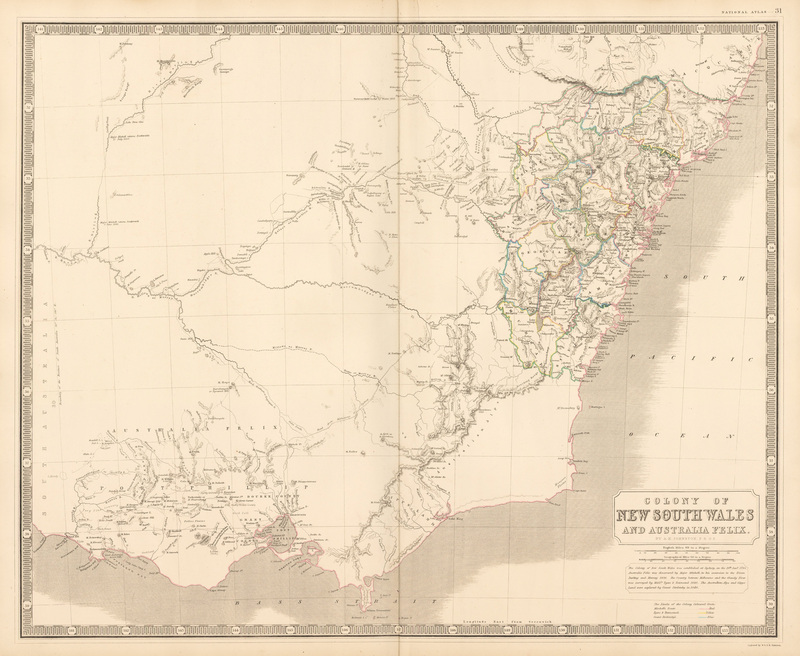 This attractive and highly detailed map includes all the provinces of the Colony of New South Wales and Australia Felix. Due to the imminent change of names, Australia Felix to Australia Victoria, the map in this version was not in production for long, thus it is quite scarce. Beautiful and clear double page map divided into counties, circa 1844, before the discovery of gold. Johnston depicts towns, major routes, waterways, and all topographical features in great detail. Various important routes are indicated such as Mitchell’s (1836) in red, Tyer & Townsend’s (1840) in yellow, and Count Streletsky’s (1840), in blue. A note in the lower right quadrant provides a bit of information regarding the territory. This engraving has original hand outline color. Johnston was a Scottish geographer and Fellow of the Royal Geographical Society who eventually became Geographer Royal of Scotland. The map features many names for the new land which were taken directly from UK landmarks and historical places. The ‘keyboard’ border increases the map’s attractiveness. Condition: This map is in A condition on heavy, thick paper. Minor separations on the upper edge have been repaired with archival material on the verso.